Combining two powerful forces to receive from God. 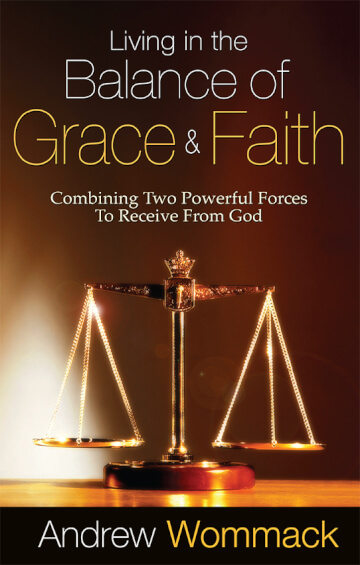 Grace and faith are often seen as opposing forces. Many of those who emphasize God's grace believe once we are saved, His blessings, (peace, healing, prosperity) are then distributed sovereignly as He wills. Many of those who emphasize faith believe what we receive from God is up to us; our willingness to study the Word, pray and fast, attend church, and even pay our tithe all determine God's blessing in our lives. The real truth lies somewhere in between. Grace and faith are both essential ingredients in our walk with the Lord. However, emphasize either to the exclusion of the other and the imbalance will make it difficult to receive from God. This lack of understanding has led to much confusion, frustration, and disappointment in the Body of Christ. One of the most common questions Andrew is asked at his meetings across the country is: "What do I need to do to receive the blessings of God?" It is then often followed by this explanation: "I have been praying, reading my Bible, going to church, and paying my tithe yet I do not seem to be able to get my prayers answered?" In that question and explanation lies the root of the problem. Like many Christians, they have fallen into the trap of linking God's response to their performance. It is the very thing the Apostle Paul spent his life of ministry attempting to change. The answer to their question begins with the correct understanding of grace and faith and how they work together. In this book, Andrew clearly explains both concepts and how living in the balance of the two will change your relationship with God forever.